One of my go-to meals is breaded, baked chicken with a veggie and a starch – usually rice. Chicken is tricky since there is such a fine line between perfectly cooked and overcooked, and no one likes dry chicken. But plain old breading just doesn’t cut it – way too bland for my taste. So I experimented and came up with what I truly believe (and what others have told me) is the best ever breading mixture. The whole wheat bread crumbs are absolutely key. Yes, they really do make a big difference. Even members of my family who are white bread fanatics prefer this breading, so even if you’re not usually a whole-wheat eater, make an exception for this breading. Will regular breadcrumbs work? Yes. But you will not get the full effect. Use up what you have left of the regular and then make the switch, you’ll be happy you did. The other key is the parmesan cheese. I never claimed that this recipe was going to be uber healthy – and just wait for the butter I mention below – but it is absolutely worth it, especially if you pair it with healthy sides. Now, this breading is amazing and works well with both chicken and fish, but there’s more to the deliciousness than just the breading. Below is the classic chicken recipe. 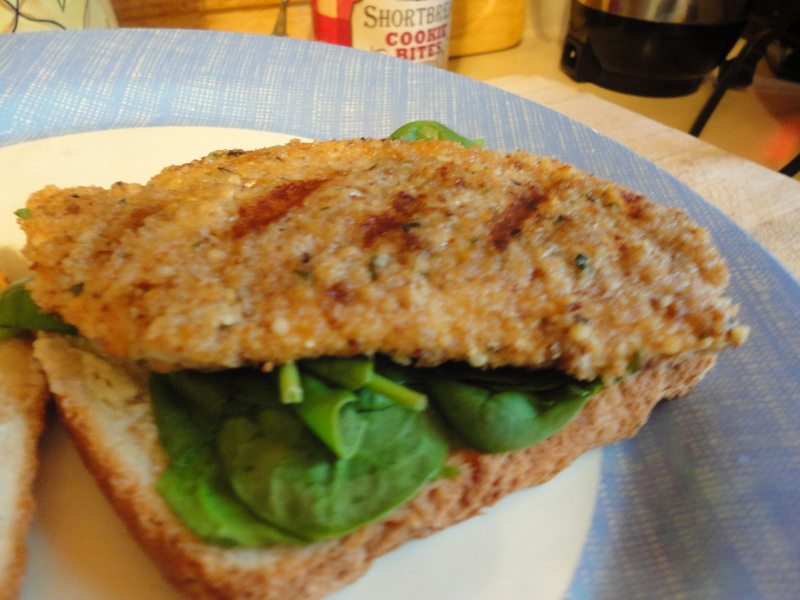 In posts to come I will be including other recipes that use this breading and ways to mix it up a bit as well as different ways to use this chicken recipe (paninis, a healthy take on chicken cordon bleu, etc.) – so look out for those! Add egg whites and a splash of milk in to a bowl and set aside. Mix up Best Ever Breading and set aside. One at a time take a boneless, skinless chicken breast that is completely defrosted and at room temperature (yes, room temperature) and use a meat mallet (spiky side down) and tenderize the chicken. Season with salt and pepper on both sides. Dip chicken breast in egg mixture and then coat with breading. Place the chicken in the baking dish – they can be close together, but make sure they are not touching. Melt 1 table spoon of butter, margarine or buttery spread – whatever you use will be fine! I’ve tried this with butter, Olivo, Country Crock and Best Life Buttery Spread and they were all the same. Using a teaspoon, pour about 1 teaspoon of butter over each piece of chicken. Do not coat the entire piece, just drip some of the butter over the breading. If butter is a concern you can leave this step out – but it does make it very tasty! Bake time will differ based on how thick your cut of chicken is, so I would suggest baking for 10 minutes and checking on it, then going from there. My mom doesn’t really like chicken, and one night when I offered to make dinner this is what she says to me “Well, what kind of chicken, because I really don’t want just a dry piece of chicken” – She was skeptical, but one bite had her singing a drastically different tune. She commented on how good it was at least five times while we ate and several times around the rest of the family the next day. For new year’s eve this past year we did a little bit of a potluck-style appetizer hour at my friend’s apartment. I wanted to make something with some protein since I knew that this would wind up being dinner for some guests, and knowing the type of night that NYE tends to be, I knew we needed something of substance. I made this chicken, but before breading it I cut it up in to bite sized pieces. I brought them prepared, but no cooked (I’ve done this a few times, it travels pretty well, actually). I put them out with a dish of spicy brown mustard for dipping. Half an hour later, there was only one left (my friends are pretty polite) and the mustard wasn’t even touched. The next morning all anyone could talk about was how good the chicken was. Moral of the story: This really is the Best Ever Breading mixture and it is a sure-fire crowd pleaser.